The sacrament of making chicken casseroles. I was so struck by that line because earlier in the same day, I took a quart of soup with all the fixin’s to a friend who’s been sick with walking pneumonia. Not exactly chicken casserole, but the same sentiment. It’s the sacrament of caring for other people. And it’s one that’s easy to dismiss. For me, making soup from scratch and delivering it is easy. For some, that might be a nightmare. But we all have strengths when it comes to comforting others. As the recipient of kind gestures from friends and strangers alike during my mother-in-law’s battle with cancer and subsequent death, I can tell you this: it makes a difference. Something about soup seems to exemplify the way personal connections can nourish the soul. But even if making soup isn’t your gift, don’t underestimate the value of reaching out to a friend in need. However, if making soup is up your alley, I’m excited to share this recipe! When I told my friend I wanted to bring her food, she specifically requested spicy chicken tortilla soup. Truth be told, this was not something in my typical rotation. So I did what I usually do: I googled it. I was confronted with the typical (broad!) spectrum of recipes. I realized that most of the recipes were full of summer harvests: sweet and hot peppers, tomatoes, corn, and onions. I set out to make it as “from scratch” as possible, which meant roasting my own tomatoes–I bought discounted “scratch & dent” ones at the market–and toasting my own tortilla strips. Thanks to globalization, you can make this soup year round, and there are many shortcut substitutes you could take, like canned or frozen veggies. But if you have the privilege of access to fresh, in season vegetables, I think you’ll taste the difference. In a large pot, heat oil over medium heat. Add onions with a pinch of salt and cook until softened and turning translucent, about 3-5 minutes. Add peppers, jalapeño, and garlic (remove seeds from jalapeño for less spice). Stir and cook until vegetables are all softened, another 3 minutes. Add broth, tomatoes, black beans, corn, and spices. Stir well and bring to a simmer for 15-20 minutes. While soup simmers, shred chicken using two forks or your hands if cool enough. Add shredded chicken to soup, stirring to incorporate. Taste broth and adjust seasoning as necessary. If the soup is too thick, thin using reserved chicken poaching liquid. 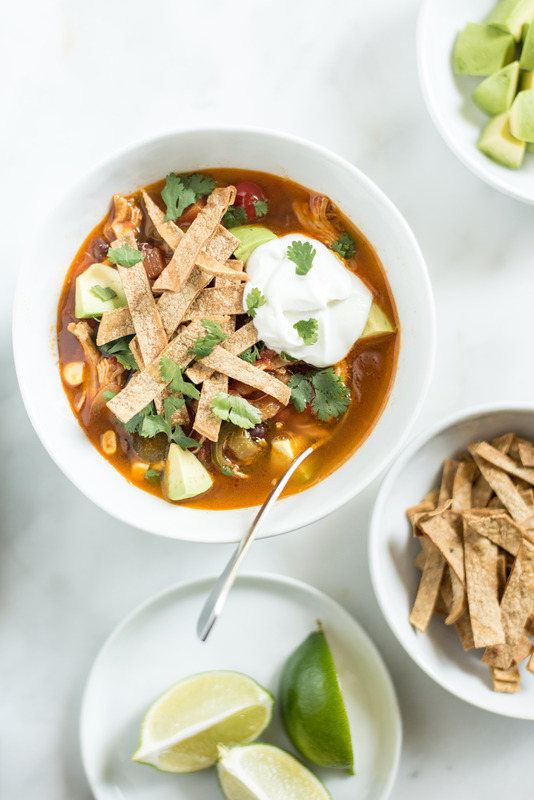 Serve hot with tortilla strips, fresh cilantro, lime, sour cream (or plain greek yogurt), and/or shredded cheese, if desired. For roasted tomatoes: preheat oven to 375°F. Core 2 lbs tomatoes and cut into 1-2” pieces. Lightly toss with oil and spread in a single layer on a large rimmed baking sheet. Roast for 45-60 minutes, tossing once or twice, until tomatoes are soft and juices syrupy. Transfer tomatoes and juices to a heatproof bowl or jar or directly into soup when ready. If making ahead, refrigerate in an airtight container. You can also use a large can of roasted tomatoes. 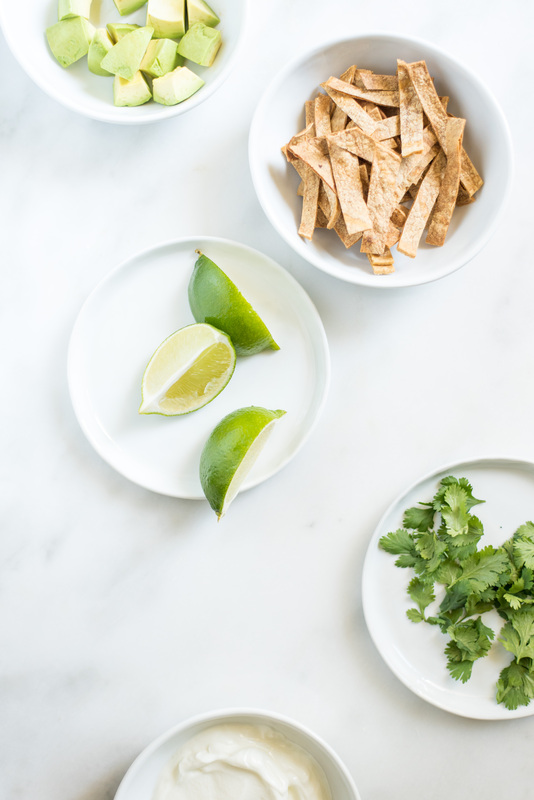 For tortilla strips: cut 6 small corn tortillas into ½” strips about 2” long. You can either toast them in a 400°F oven for about 15 minutes, or pan fry them in oil over medium heat until crispy (best done in small batches).